2007 World Youth Chess Championship is taking place in Kemer, Antalya with 1450 players from 103 different countries. With all the accompanying persons, VIPs, staff of TCF, journalists, coaches etc. there are 2500 people that are in Kemer for this organization. This is the second largest sports organization in the history of Turkish Republic after 2005 Universiade which took place in ?zmir. The TCF personnel is working all day and night for accreditation Three hotels (Limra, Alinda and Sailor's Beach). The opening ceremony took place with many players, Deputy President of Türkiye ?? Bankas? Prof.Dr.Baran Tuncer (main sponsor of TCF) , Member of the Turkish Parliament Prof.Dr. Yusuf Ziya ?rbeç, FIDE Administration, Deputy Governor of Antalya Fazl? Akgün, many other guests including players, coaches, local, national and international journalists were in the opening ceremony. There was also a folk dance after the protocol speeches. You can find the details of the protocol speech including Prime Minister of Turkish Republic Recep Tayyip Erdo?an's message for the young chess players. You can find many pictures at the tournament page photo gallery, videos and press releases are also available at the tournament page. 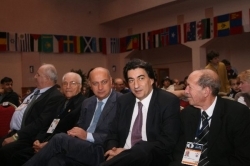 Left: Honorary President of TCF Kahraman Olgaç, FIDE Vice President Zurab Azmaiparashvili, FIDE Deputy President Georgios Makropoulos, Continental President of Americas Jorge Vega. Right: A scene from the ceremony hall. A very happy and glamorous day for TCF President and FIDE Vice President Ali Nihat Yaz?c? The first speech of the ceremony was delivered by President of the Turkish Chess Federation Ali Nihat Yaz?c? who was also recently elected as FIDE Vice President in 78th FIDE Congress stating such a big organization was merely a dream ten years ago but with the help of main sponsor Türkiye ?? Bankas? (the first national bank of Turkish Republic) Turkish Chess Federation is changing the fate of chess not only in Turkey but also around the world. He also added that Turkish Culture and Tourism Ministery and State Ministery (also responsible from sports) was really helpful before the organization. "TCF has been preparing for this event for two years with every detail considered and we have to be even better than we planned since we wish to see you again in 2009 World Youth Chess Championship." Türkiye ?? Bankas? Deputy Chairman of Executive Board Prof.Dr.Baran Tuncer, main sponsor of TCF. Main sponsor of the Turkish Chess Federation, Türkiye ?? Bankas? was represented by the highest level, with Deputy Chairman of the Executive Board of the bank Prof.Dr.Baran Tuncer stating that they are glad to cooperate with the Turkish Chess Federation since they see that it is the best sponsorship deal of the bank that has ever been signed. He also noticed that he sees that TCF is organizing the event with the best way possible. TCF President Ali Nihat Yaz?c? with Deputy Chairman of Executive Board of Türkiye ?? Bankas?, the main sponsor of Turkish chess federation, both are extremely happy about the sponsorship deal as you can see from their faces. The third speech was of Deputy Governor Fazl? Akgün stating that hosting such a big organization is a very pleasant for Antalya Governorship and hope that there would be many other big chess tournaments in the future. Member of the Parliament from Antalya Prof.Dr.Yusuf Ziya ?rbeç , a member of EU Commission in the Parliament who got a message from Prime Minister of Turkish Republic Recep Tayyip Erdo?an Member of the Parliament from Antalya Prof.Dr.Yusuf Ziya ?rbeç stated in his speech that Turkey is multicultural country. Antalya is also one of these places and all the guests are welcome to Turkey. He also added that he has a message from Prime Minister Recep Tayyip Erdo?an stating that he sends his best wishes and love for all the young ones in Antalya, since they are the most important ones for all of us." He also thanked the contributors of the organization. 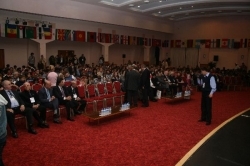 The last speech of the event was delivered by Honorary President of FIDE Florencio Campomanes stating that he is glad to be here in Turkey and asked from players that they should not find any excuses for their losses except the bad moves since the Turkish Chess Federation is providing every possible facility to the guests in the best way possible. Left: TCF Board Member and National Team Manager Özgür Solako?lu, General Coordinator of the event and Vice President of TCF Tahsin Aktar and on the right Gülk?z Tülay another board member, head of Tarsus Zeka Chess Club who has more than 1,100 members and their club is the last runner-up in Türkiye ?? Bankas? Chess League. Right: Özgür Solako?lu again this time with Bülent ?nan, PR Manager of Türkiye ?? Bankas? Left: GM Artur Yusupov has his kids playing here , a former elite grandmaster now slowly becoming a veteran, definitely a legendary name and one of the best trainers in the world working with Mark Dvoretsky another trademark name. 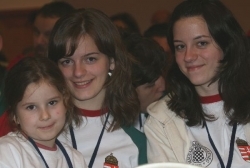 Right: Hungarian girls seeming to enjoy the opening ceremony. General Secretary of FIDE Ignatius Leong with her spouse Celine Dao watcing the opening ceremony.